Website managers should assign the following document management system roles for sharing documents on a website – Users, Reviewers and Administrators. Once in place, the structured workflow of a document management system, or DMS, makes each of these roles accountable and responsible for finalizing documents. After all, it is the document management system roles that provide unique content for websites beyond what a simple content management system (CMS) like WordPress will do. A generation ago, there were Electronic Document Management (EDM) systems that specified document extensions based on proprietary nomenclature. But for today’s document management system roles there are no limitations on what types of files these participants upload and manage. Static websites are no longer sufficient because websites are fast becoming the destinations for peer review of all types of content for compliance, legal or group review requirements. For tracking, approving and storing electronic documents on a website, the document management system provides a library of PDFs, spreadsheets and other files that make websites useful for visitors looking for collaborative libraries where useful information can be easily accessed. User Document Submission – The common user can upload the document with specific naming and summary information accompanying it. Once uploaded, the user may also delete or replace the document. Users may or may not choose specific categories when submitting, but users do not typically have the ability to see other user submissions. Their document can be approved or rejected at any time by the administrator. Automatic Email Alerts – Whenever an action is taken by a user the administrator receives an email alert. This parameter may also be extended to reviewers. Time stamps also help keep updates straight for all roles. Administrator Approves Document – This role is typically a unique one assigned to an office employee who is responsible for approving submissions. Because some submissions may be of bad quality or otherwise inappropriate, the administrator has the ability to accept, reject or defer a submitted document according to predefined parameters. Automatic Email to Reviewers – Once the document is approved by the administrator, an email alert goes to all reviewers who are prompted to log in and take action on the document. 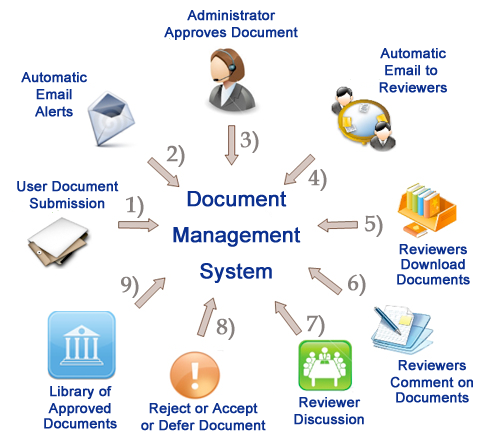 Reviewers Download Documents – (Reviewers are assigned by the administrator.) Once logged into the DMS, the reviewer will see a list of the approved documents and the associated titles, details and users who submitted them. Reviewers Score & Comment Documents – By writing a reviewer’s own comments and updating the status of each document to Accept, Reject or Defer, he or she provides feedback in a forum for other reviewers to see. Reviewer Discussion – Administrators have the ability to run reports to aggregate all the comments and tally the votes for accepting, rejecting or deferring a document. Reject or Accept or Defer Document – A running tally is summarized for the administrator to finalize a status for the document. Because parameters may differ for how a document is rejected, accepted or deferre, this subjective step may require offline processing and further discussions. Library of Approved Documents – Once a document is deemed “approved” by the administrator, that document will be stored in a public or private directory, with or without reviewer comments in tact. A full audit trail exists for each document. By assigning the proper document management system roles, website managers generate content to a website’s library of approved documents while meeting deadlines and maintaining accountability. While the DMS is a single component to building a website, it is a powerful workflow tool within a content management system. What’s more, a website manager delegating these document management system roles is no longer reliant on posting and managing documents on behalf of everyone; instead, the DMS workflow solution is self-sufficient. These three roles take responsibility for posting and managing files on one website so the website manager can sit back and watch the site build itself. Strategy for rebranding a website should be modeled after the folks convincing Asians to pay $45 for a PBR – fresh design and clever content sells. At some point most website managers realize a website is dying. Remiss to update content, designs, features or pictures – it’s the rebranding that revives a languishing website. One of the cleverest of rebranding ploys comes from Pabst Blue Ribbon company who rebranded their infamous swill four years ago. Since then, they’ve proved it is about marketing the old name, it is about writing fresh copy explaining why it’s better than the predecessor, and it is about creating a “must-have” for customers. Consider this new and improved Pabst Blue Ribbon brand, better than the proverbial hipster beer sold at dive bars or wherever America tries to be urban, built on the quality of the beer that in 1893 won a single blue-ribbon in Chicago. It’s the beer we’d buy for our mechanic or for a cousin changing the oil on his Dodge Charger. It’s working class simplicity. PBR is that sincere American lager for blue collar men everywhere. “Built in 1999” means that you’re legit. Websites are trying to build confidence in users by listing their founding date. Similarly, PBR is built on American Grit – by putting a blue-ribbon on their cans (reminiscent of 19th Century greatness), Pabst has assured 20th and 21st century Americans and Asians of its legitimacy. What might have passed as great beer in hardscrabble nineteenth century America doesn’t compare to the fine crafted beers we know today. But customers appreciate a long and hard history leading to success. Think Levi’s blue jeans birthed from California’s 1849 gold rush; think Steve Jobs building computers in his garage; and don’t forget the New Coke failure of 1985 that led to the biggest rebranding in consumer history. All great businesses have a hardship story that consumers appreciate when communicated appropriately. Rebranding a website should include those tales of hardship. Consider translation services to put your website on the cutting edge in a new country. 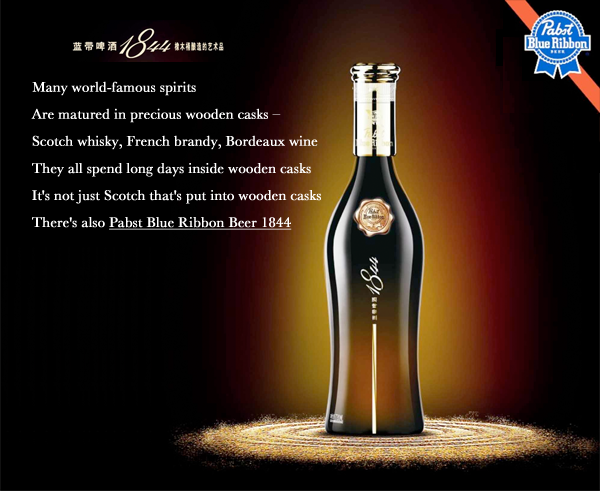 The makers of Pabst Blue Ribbon 1844 introduced their ale in the booming Asian market by marketing a sleek design in a high end box. They also created content campaigns celebrating the “German caramel malt (no-rice, all malt) and American cascade hops. Aged in new American oak barrels.” Selling America as a brand can be quite a boon. Consider rebranding a website based on patriotism and origin. Traffic to websites can change as quickly as Google effects changes to its algorithms, so rebranding a website as “Great Again” will keep people talking about how great the tradition is. For PBR, the simplicity of it’s working-class branding peaked in 1977 with production topping 18 million barrels. By 2001 the brand’s sales fell below a million barrels and the company was eventually bought by C. Dean Metropoulos. After falling on hard times, the website has become one of the most sought after brands in beer. In fact, the U.S. Securities and Exchange Commission forced two advertising executives in June 2011 to cease efforts to raise $300 million to buy the Pabst Brewing Company. The two had raised over $200 million by crowdsourcing, collecting pledges via their website, Facebook, and Twitter. Remember, rebranding a website is a bold move meant to revive or defend your customer segment from going elsewhere. So, grab a cold six-pack of PBR and begin rebranding a website – just remember to put it in a nice box and call it sentimental. Consumers are paying hundreds for used software CDs to avoid new cloud subscription fees and crippling cloud outages. Used software CDs are golden on eBay despite Big Tech’s effort to market the convenience of cloud subscription services. It turns out used software CDs are helping users maintain higher productivity while saving thousands in unnecessary upgrade fees. That’s why you should save your used software CDs, or sell them on eBay. Adobe experienced an extended outage on May 15, 2014, which means millions of customers who use Adobe Creative Cloud couldn’t access the software services. A hard install on your own system would have saved a day of productivity – at least. Frequent bandwidth issues and connectivity problems, whether your problem or there’s, results in lost productivity. Adobe’s two-day outage prevented millions of customers from accessing Photoshop, Illustrator, Dreamweaver and a host of other software applications. Everyone knows that a car lease is a bad deal for individual consumers. Software works the same way. For example, an old version of Adobe’s Dreamweaver CS5 is listed for $359.00 on eBay.com, but that price is paid once. Savvy website managers have realized one hard install will pay for itself after 12 months instead of getting fleeced by Adobe’s subscription service every month. Adobe’s leasing program means the new cloud-hosted version will cost $29.99/month in perpetuity! Two years ago both Apple and Amazon experienced breeches in their security when hackers accessed cloud accounts, deleting files and stealing information. On October 3, 2013 Adobe reported that hackers stole 3 million customer credit card records used for their subscription services, including all the passwords. The fact of the matter is that cloud services are dependent on password-based mechanisms and third-party security protocols that often fall into criminal’s hands or break due to the negligence of employees. Perpetual licenses are much less likely to expose a software owner to these type problems. There are countless examples of users complaining about disasters following forced upgrades. The Microsoft Community forum has thousands of posts from customers recalling their frustration with upgrades. Angry blogging occurs after nearly every Adobe Photoshop software upgrade, with users complaining about lost files and features, then the countless hours spent restoring their software to familiar order. Multitudes of Adobe plug-ins and presets are deprecated after each release of Photoshop while missing features in Adobe Dreamweaver CS5 software required re-installation of 25 plug-ins following that release. For their newest version, Adobe lists these improvements for Dreamweaver CS6: Fluid grid layout for cross-platform design, CSS3 transitions, HTML5 code rendering with Live View and Multiscreen Preview, enhanced jQuery Mobile and PhoneGap Build framework support, optimized FTP performance. The Adobe “feature creep” isn’t worth the trouble. Finally, many of us have collected used software CDs over the years, used once and dutifilly filed back on the shelf with the serial numbers and activation codes dutifully guarded. But now might be the time to sell them on eBay for extra cash. After all, used software CDs are something website managers everywhere need to maintain productivity. The formula for building a successful digital presence has changed. No matter how much money is spent on a website, having a website is not enough. A failed marketer is one who builds a website to separate the company from the crowd rather than to unite it with the common market. By allocating too much time and too many resources on branding and usability, many website managers continue to fail in delivering new customers and in servicing existing ones because they've built little more than a static digital magazine peddling a service the website does little to support. When nobody bothers to visit, website managers can have a hard time explaining why. What flavor is your website?